It is time to give back to our hard working service men & women of the community! We are super excited to announce our special promotion for the month of AUGUST! 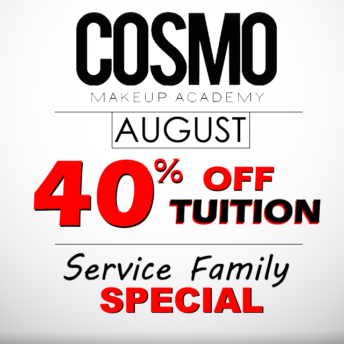 We are offering 40% off That’s right, 40% our tuition for all SERVICE MEN & WOMEN FAMILY MEMBERS! Than you are eligible for this promotion! Call now for any questions or to make an appointment for a tour at one of our campuses & begin your career in makeup artistry today!